When travelling to a hot and sunny destination, it’s crucial to pack a few essential items to keep your hair and skin looking fabulous after a day in the sun. I wanted to share with you my beauty kit that came with me to St Lucia in May. 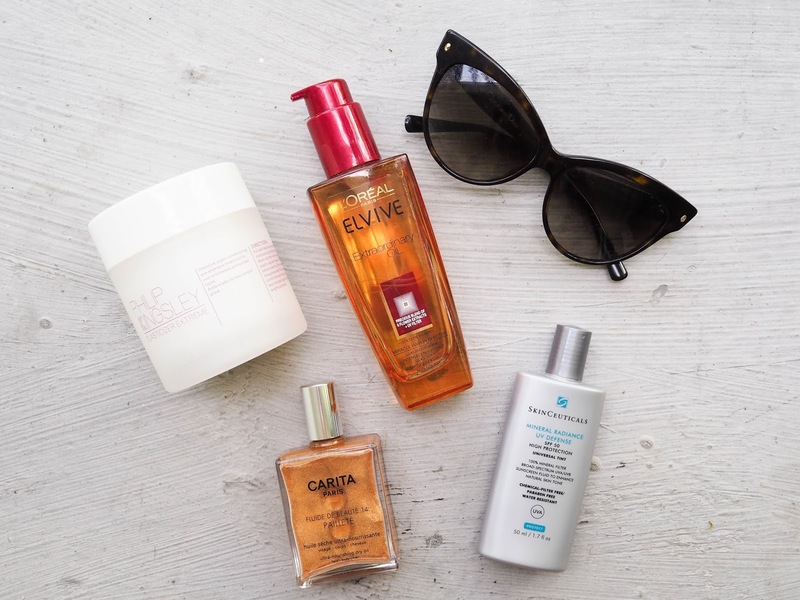 These products remained in my beach bag for the entire holiday, and without them I dread to think what my skin and hair would have looked like by the end of the 10 days! For my hair, I used Philip Kingsley elasticizer every day. I lathered it on either around the pool or beach when my hair was wet and kept it on for a few hours, or for 10 minutes before I showered in the evening. I can’t even describe how soft and silky it makes my hair feel! After I’ve washed my hair, I apply the L’Oreal oil on wet hair and also when it’s dry after styling too. I only need about 2 pumps and it gives my hair a gorgeous shiny, healthy look. My all time favourite product at the moment is the gold Carita oil. It’s such a luxury product, both the bottle and product itself! I apply it on my chest, arms and legs after a shower, leaving my skin silky soft, and run the excess through the ends of my hair. It leaves a very subtle shimmer which is perfect for Summer evenings on holiday. Finally, the most important product of them all! During the day, I use the SkinCeuticals SPF 50 on my face and neck without fail. It’s made from 100% mineral filters so feels completely weightless on your skin. It’s so important to product your skin from sun damage, and this product does just that. It’s also a tinted moisturiser with a very slight colour to it, so it evens out my skin tone too. Win win! A popular misconception about high SPF sun screens is that they don’t allow you to get a colour. This is so untrue and irritates me when people say this! I got a lovely colour on my face despite wearing SPF 50. The only thing it didn’t allow my skin to do is burn, which is absolutely terrible for your skin if this happens. Shop all products in this edit below!